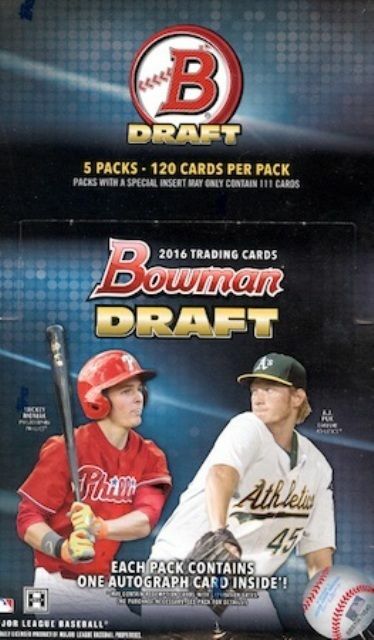 Each Bowman Draft SUPER Jumbo Box contains Five Autographs! Look for Gleyber Torres Cards! Look for Low-numbered wave refractor autograph cards! Look for Prospect Autographs of A.J. Puk, Alex Kirilloff, Forrest Whitley, Kyle Lewis, Matt Manning, Mickey Moniak, Bo Bichette, Braxton Garrett, C.J. Chatham, Cal Quantrill, Cole Ragans, Dane Dunning, Corey Ray, Dakota Hudson, Delvin Perez, Ian Anderson, Will Benson, Riley Pint, and Taylor Trammell.